Win FREE Tickets to See John Carpenter at Myth Live! 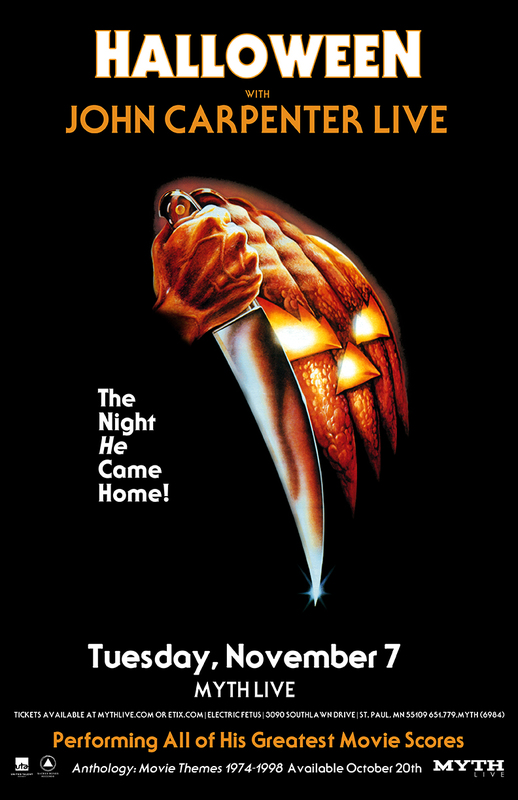 Earlier this week, it was announced that director, screenwriter, producer, musician, editor, and composer John Carpenter is launching his Anthology Tour to celebrate his new album, and he’ll be at Myth Live in Maplewood on November 7. Tickets go on sale tomorrow, but we’re giving you the chance to win a pair for free! To enter, just (1) like the giveaway post on the Twin Cities Geek Facebook page and (2) tag a friend in the comments who might like to go too. We’ll randomly choose 1 winner at 3:00 p.m. Central on Wednesday, August 30, who will get 2 tickets to the show! No purchase necessary. Total number of prizes to be given away is 1, each consisting of 2 standard tickets to the John Carpenter: Anthology Tour at Myth Live. Total retail value of each prize is $90. Any other expenses incurred as a result of winning this prize, including taxes, are the sole responsibility of the winner. Prize fulfillment courtesy of Knitting Factory Presents. How to Enter: Like the designated post the Twin Cities Geek Facebook fan page (https://www.facebook.com/TwinCitiesGeek/posts/1161537253978864:0) and tag another Facebook user in the comments. Only one comment per person and only top-level comments will be counted, not nested replies. Eligibility: One entry per person. Giveaway is open only to legal residents of Minnesota who are 18 years of age or older at time of entry. Void where prohibited by law. In order for an entry to be counted, the Facebook user must like and comment on the post by 3:00 p.m. Central time on August 30, 2017, and their comment must tag another Facebook user. Current Twin Cities Geek contributors and editors are not eligible for entry.